Three-Card Poker Cheat Busted Switching Cards at Pennsylvania Casino! The rinky-dink casino cheat scams continue in Pennsylvania's new table-games casinos. The latest is a card-switching cheat expedition carried out by thirty-eight year-old Kip Patton Sr of Philadelphia at the Parx Casino in Bensalem. Patton was at the table playing two separate hands of three-card poker, and he decided to improve his odds of winning by switching cards between the two hands to improve one or both of his hands. Card-Switching can be a very effective method for cheating at poker and casinos--WHEN done by professionals. No doubt Patton is a rank amateur. If he were more professional, I doubt the novice surveillance staff would have caught him. Read more about first-rate card-switching cheating scams here. What Really Happened to Casino and Poker Cheats in the Old "Mob Experience" Days? Have you heard about the new "Mob Experience" tourist attraction at the Tropican Casino-Hotel in Las Vegas that's slated to open March 29th? If not, it's simply a Mafia gig where you pay $40 and walk through a door into the history of the Mafia and various mobsters who thrived in Las Vegas since gambling became legal there in 1931. You are accompanied by the voice of the celebrity actor you choose upon entry (James Caan, Tony Sirico and others who have portrayed gangsters in movies and TV) who guides you through the tour. You visit Mafia hangouts, sit-downs, Prohibition-era saloons, police stations and, of course, casinos, meeting infamous mobsters like Bugsy Siegel and Meyer Lansky. Along the way you stumble onto a casino catwalk (the old-days' pre-video-camera surveillance system where ex-cheats hired by casinos peer through one-way mirrors at cheats in action on the tables) and witness a cheat getting caught switching cards on a blackjack table, who is then dragged away by a bunch of big goons carrying Louisville Slugger baseball bats and beaten up behind a door behind a silhouette image. 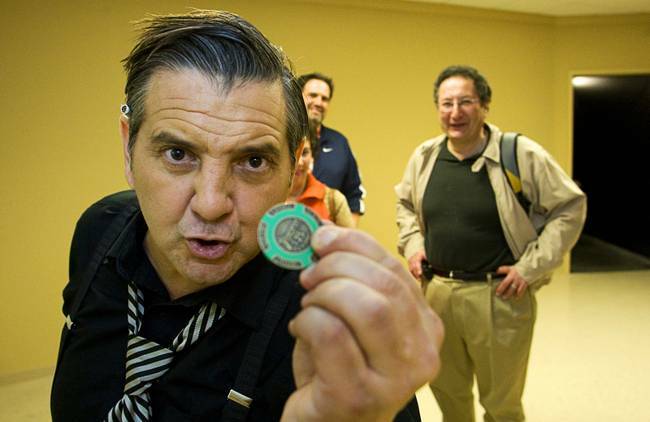 So, what really happened to those unlucky casino and poker cheats caught cheating in these old Vegas mobster days? Were they really beaten and sometimes taken out to the desert and "hit" (killed)? You bet, although the beatings were far more frequent than actual killings over cheating incidents. The mobsters running the casinos back then were more interested in teaching would-be cheats a lesson in deterrence by having them see the faces of their peers bandaged up and their legs broken. All this rough stuff against cheats ended in the late '70s, luckily for me about the time I got started in the casino-cheating business. Although in the beginning of my casino-cheat career I was threatened with physical harm in casino backrooms (one security guy at the old Desert Inn telling me he was going to take me up to the roof and push me out onto the Strip), no one ever actually laid a glove on me. Dealer in Singapore's Resorts World Casino Cheats it Out of More Than $100 K! Another story of how oceans of casino cheats are preying upon Singapore's two casinos--from the inside, outside...and just about everywhere. How inept can Singapore's casino surveillance departments be? The daughter of a famous actor has been sentenced to twenty one months in jail after stealing $110,400 worth of chips while working as a croupier at a casino. Chiu Yee-Fong, 30, daughter of famous Taiwanese actor Chiu Yong Qin, (pictured right), was working as a croupier at Singapore’s Resorts World Sentosa Casino, where she squirreled away the vast amount of $100 to $1,000 chips between 28th September to 7th November, 2010. Over a month period, Chiu Yee-Fong would take chips from her float and later discreetly hand them over to her boyfriend to cash, telling him they were her tips from customers. Most of the money she then deposited in her DBS savings account, although $11,100 in chips were also discovered at her dormitory in Toa Payoh. Chiu Yee-Fon managed to get away with the continual theft until one day a fellow croupier noticed a chip on her chair during one of her breaks, and a later examination of CCTV footage then showed she had placed chips into her blouse on no less than 144 occasions. Subsequently, police were able to recover $96,157 from her with her parents paying back the outstanding $14,243 to the Resorts World Sentosa Casino. After she received the 21 month sentence in court on Tuesday, Chiu Yee-Fong was reduced to tears and wept to her parents that she wanted to go home. Despite her sentence, things could certainly have been worse for the famous actor’s daughter, as she could have received up to 15 years in jail and/or fined up to $150,000 for criminal breach of trust. My take: Man, if HER looks could kill! This really goes to show how weak surveillance departments are in Singapore. I also get the feeling that this little Asian hottie was in it just for the thrills! Now she'll have to chill out awhile. Any Truth to Online Blackjack Cheating Claims? If you surf blackjack cheating online, you will come across various sites claiming various methods for cheating online blackjack games. Are any of these claims true? Let's examine the two online blackjack cheating methods I have come across the most. The first is the use of blackjack cheating bots. What is a blackjack bot? It is exactly the same thing as a poker bot. It keeps track of the cards played and allows the user to make decisions on betting strategies and hand-play based on the cards already played. Sounds good but the only problem is that at best these blackjack bots might help you count the cards, but unfortunately that means nothing as the cards are shuffled randomly via random number generators after every hand. In short, you can toss your blackjack bots. The second blackjack online cheating claim is that you can use online blackjack cheat software to bypass the effectiveness of the random number generator, which shuffles the cards at a supposed total randomness. Although it is true that no machine can generate total randomness in card shuffling, the algorithm of shuffles is not predictable no matter what kind of software you are using in that aim. Sites selling random-number- generator cracking equipment claim that programs can find patterns in cards already dealt which allows it to predict the next cards that will be dealt and give an advantage to the user. They say that this is possible through flaws in random number generators. Only problem: the flaws, although there, are never nearly big enough to allow the online blackjack game to be beat via that type of cheating method. My take: Forget about online blackjack cheating and stick to online poker cheating! UB.com COO Leggett Responds to Travis Makar's Online Poker Cheat Claims...Calls Them Extortion! The poker world was stunned last week when Travis Makar, one of the people allegedly involved in the Ultimate Bet super user scandal, called into the DonkDown Radio show and revealed that he had a large number of documents regarding the site’s involvement in the scandal from years ago. Makar stated that he never worked for Ultimate Bet, but he obtained the documents through years of working on the computers of major players involved in the scam. If you are saying that you are giving up on the extortion and confirming that you will not disclose the information you took from us… I am very happy to hear this. I realize that you do not trust me, and obviously it is impossible for me to trust you. Before you decide to disclose any information, I would just like to reaffirm that if you do release confidential company information, I will be forced to involve the police in this situation. However, I would prefer to exhaust all avenues of negotiation prior to doing this. I realize that money is important to you and the confidentiality of our information is important to us. If you want to meet, I would be willing to give you a reasonable amount of money (much smaller than the amount you requested), but I need you convince me that day that you will bring all of the important information and you will stop with the threats and illegal activities against our company. Leggett’s blog was posted during the airing of Wednesday’s DonkDown Radio show, which featured guests Makar, blogger Haley Hintze, and poker player Brad Booth, who said he lost around $1.5 million during the superuser scandal. Booth had his life turned upside down during that period and shared his side of the story with the hosts, including an occurrence in which Russ Hamilton called him immediately after Booth had a losing session on Ultimate Bet to offer him money to continue playing. Booth accepted and said he lost the money within 10 minutes. Makar then joined the show and confirmed that Booth had been cheated after he named off accounts that he had lost money to during the scandal. Makar was amazed that he had never met Booth before, but the two discussed their relationship with Hamilton and shared a similar bond after they each lost nearly everything following the scandal. Here is an email that I received from Mark Anthony Howe, who hawks roulette computers online that will not make you any money. Look at the video on the home page that you come too. Then watch the video, note the number under the 8 oclock postion when Hourmouzis releases the ball, he is simply placing where he wants the ball to go! This is common dealer signature, but he does not reveal this, but instead pretends he has a special magic pattern system or that his roulette computers are effective, thought you might like to see how dealers with just 30 minutes training can also do this little trick! I was the only one to spot this fraudster!" I tried to look at the video but the link Howe sent me was broken. In any event, what he says, whether it be true or not, doesn't really matter because not only is Hourmouzis a fraud--Howe is a BIGGER fraud. Avoid both these guys and their roulette computers like the plague!